LEN - www.lankaenews.com | Gamarala returns, but his families and prospective daughter in law still reveling and rejoicing in NY ! Orders CID to probe how LeN was able to get details ! Gamarala returns, but his families and prospective daughter in law still reveling and rejoicing in NY ! Orders CID to probe how LeN was able to get details ! (Lanka e News – 02.Oct.2018, 10.15PM) President Pallewatte Gamarala who left for New York to attend the UN annual general assembly returned to the Island . But his brood comprising his family , and families of his family who also went with him for mirth and merriment at public expense have still not returned. They are still reveling ad rejoicing at state expense . It is therefore a question on everybody’s lips , why on earth are they waiting there wasting public funds without returning along with their Gamarala Maharala ? If they had accompanied Gamarala on this junket at colossal state expense then they should be there to perform some colossal official task or state diplomatic duties on behalf of the country . Then , the next pertinent question is , why did Gamarala’s brood that went on the jumbo junket stay back in New York when they have no such official duties ? Can having family fun and frolic at the expense of people’s funds be condoned when the country is hard put to tide over the present economic crisis ? Meanwhile corrupt venally inclined president Gamarala who made his New York junket a private family affair to enjoy with his family , and families of his family had panicked over the exposure made by Lanka e news giving details of the room numbers and phone numbers of the hotels he and his jumbo brood checked in. Owing to this revelation he had become most cautious as regards the secret and murky doings of his brood. Gamarala who always wastes his time on irrelevant matters instead of attending to his more responsible tasks and presidential duties has ordered the CID to probe into who leaked out the information , based on reports reaching Lanka e News. Gamarala’s cowardly and foolhardy action stemming from his inability to finding solutions to the country’s economic ills rather than chasing behind those who level constructive criticisms , has necessitated Lanka e news to publish just one of the many photographs received by us relating to his junket which is by now stinking worse than his lankot after all the un-doings and murky doings in New York of his family and families of the family had come to the open. A selfie is published herein which was taken when they were enjoying themselves outside the super luxury Marriot Hotel in New York where they stayed . Only a section of Gamarala’s brood is in this selfie :Thilina Suranjith the wheeler dealer son in law of Gamarala , Sashimal Dissanayake (the son of P.Dissanayake )who got caught to the police when trying to collect a bribe of Rs.20 million on behalf of Gamarala is posing from behind, Sashimal’s illicit lover, and Nipuni Weeraratne the fiancée of Daham Sirisena. Nipuni the prospective daughter in law of Gamarala is on Thilina ‘s wristlet side in this photograph. Another profligate side of Gamarala’s family must be made known to the masses who are struggling to make ends meet. The value of the wristlet worn by Thilina in SL rupees is 8.5 million! which was bought by him in Japan. Thilina purchased this saying he wanted to wear a wristlet of the quality worn by Barack Obama . 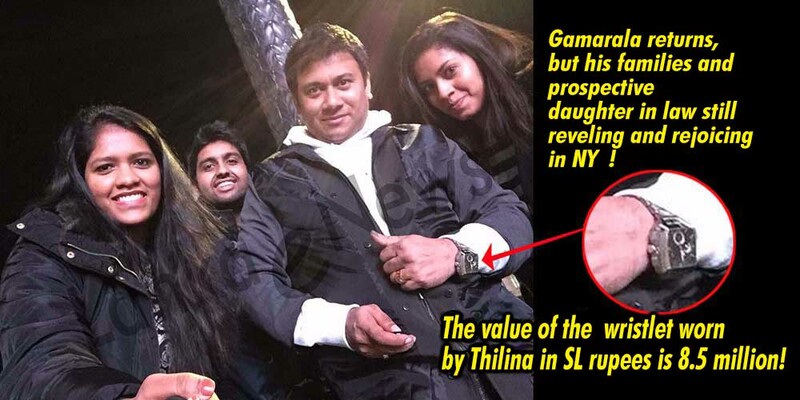 How come Thilina who was just running a small studio in Polonnaruwa before Gamarala became president , and could not afford to wear a battery wristlet from the pavement amass this amount of wealth after his FL (father in law ) became president ? It is the duty of the president who came to power bragging about simplicity and austerity , to reveal to the people how did his son in law become this rich within the few years of Gamarala’s reign to indulge in such obscene ostentation while the masses were becoming poorer since his advent ? Without first probing into that , there is no point or purpose in his wasting public funds on launching a CID investigation into how Lanka e News received the photographs . Our ‘Simple’ Simon of a president takes jumbo group of family merry makers to New York on his junket ! Shocking details…..